Do You Need Valentine’s Cards For Your Primer Piano Students? 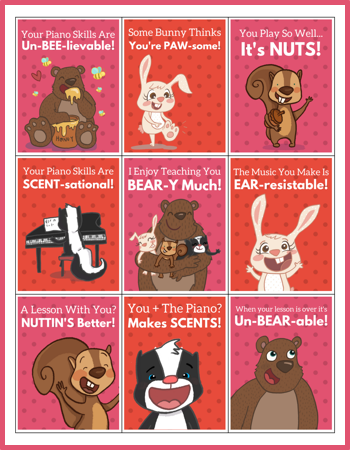 If you’ve been spending your days perusing the Printables section of the WunderKeys website then you likely have a studio full of piano students who are excitedly using Valentine’s Day-themed piano teaching resources! Today we’re helping you complete your Valentine’s Day victory with a final WunderKeys printable. Piano teachers are always searching for small gift ideas for their students for Valentine’s Day… and today we’re solving that problem for you with a printable Valentine’s Day card pack for piano students.